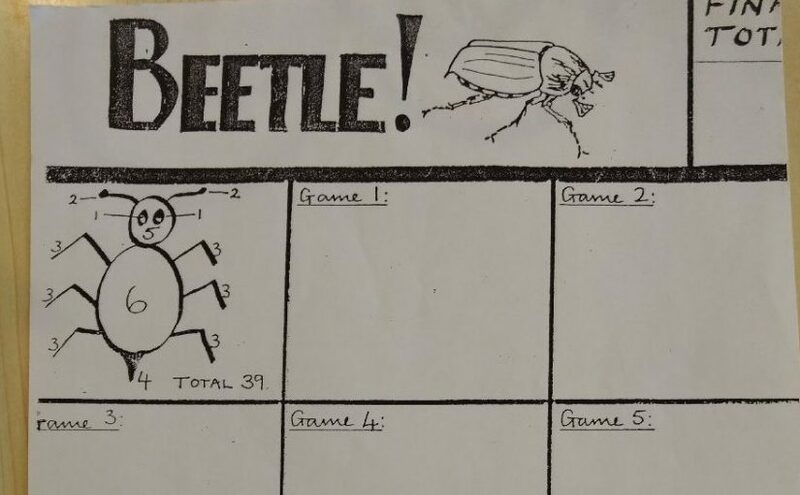 The object of the game is to draw a Beetle, rolling a dice to see which bit you can draw next, but you have to have a body or a head before you can start to add other pieces to them. Some throw swiftly – in some cases so swiftly that the dice ends up on the floor, others take their time, focussing on the dice and willing the elusive six (or five) to get them started. 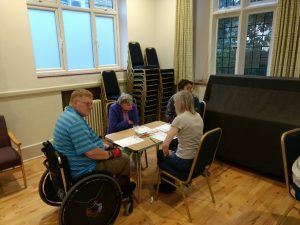 The first player to complete a Beetle calls out and everybody stops, and counts the score of the pieces they have drawn, and then the player with the highest score at each table moves to the next table clockwise, and the lowest score moves anti-clockwise. The game is thus sociable as well as allowing us to practice our mathematical, in in come cases, artistic talents (some people draw really elaborate beetles, while others – don’t). 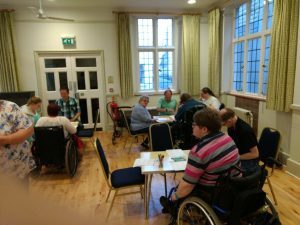 Previous Previous post: Boccia – It's my favourite !